All Keystone Windows are Gold Label certified by AAMA. The American Architectural Manufacturers Association (AAMA) is the nationally recognized accrediting source for structural design performance of windows and doors. 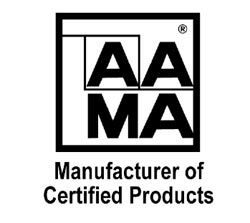 If you demand windows and doors that meet stringent performance standards, just look for the AAMA Certification Label. Products that have earned the right to display this label have had a sample unit pass independent laboratory tests, and only products that bear this prestigious label are certified by the manufacturer. Plus, production lines for windows and doors in the AAMA Certification Program are subject to two unannounced annual inspections. AAMA provides the industry standard rating for air infiltration. Our windows are all Gold Label certified by the AAMA.